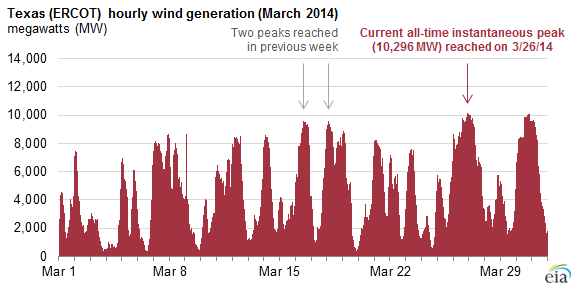 The graph shown above displays the hourly wind generation for Texas (ERCOT) for the month of March 2014. The graph appeared in the U.S. Energy Information web site “Today in Energy” on 23 June 2014. As indicated in the graph, the state of Texas reached a new instantaneous peak wind generation of 10.296 GW at 8:48 pm on March 26 2014. The average wind production during that hour was 10.12 GW, equal to almost 29% of the total electricity load for the state of Texas. As of May 2014, Texas had a little over 12 GW of utility-scale wind capacity – about one-fifth of the total US wind capacity. Our Perspective: Perhaps the main takeaway from this graph is not the fact that wind generation reached a new peak on March 26th 2014, but that during a significant part of the month wind generation dropped to almost negligible levels. The main challenge for wind generation is its’ highly variable and intermittent nature even when aggregated over thousands of wind turbines spread over a wide geographic area, as this graph clearly illustrates. Absent a significant engineering breakthrough in energy storage capacity, and development of an almost entirely new and greatly expanded national electrical grid, it simply may not be possible for renewable energy alone to meet the long term needs of the US.